Winter Park, Fla., unveiled six electric car charging stations in January in a ceremony that also displayed several electric cars available on the market. The stations were funded by a grant from ChargePoint America, a program sponsored by Campbell, Calif.-based Coulomb Technologies to provide electric vehicle charging infrastructure to selected regions of the United States. 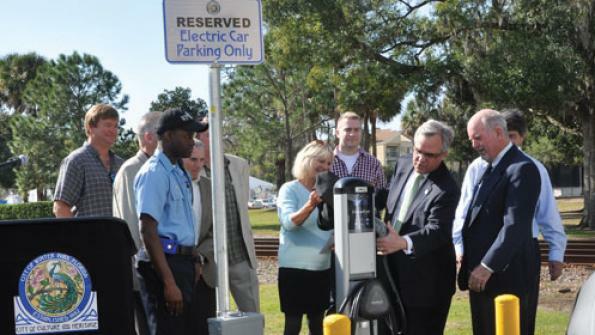 Since January 2011, Winter Park’s Electric Utility department has been working with Eustis, Fla.-based WattNext to provide power and prepare sites for the installation of the electric charging units. Residents and visitors now can charge their cars for free at any of the stations, which are located at the Winter Park Public Safety Facility, Central Park, a municipal parking lot next to an Amtrak Station, Winter Park City Hall, a tennis complex, and Hannibal Square Heritage Center.